Today, traffic-infrastructure is a prerequisite for a functioning economy and social life.The maintenance of traffic related structures such as roads, bridges, tunnels or railway lines causes considerable cost and in many cases obstruction to traffic flow.In this situation, methods that provide information on the present condition of traffic structures non-destructively and economically are of great interest. It has been shown that Ground-Penetrating-Radar (GPR) can deliver information that is useful for the planning of maintenance work for many different types of traffic infrastructure. 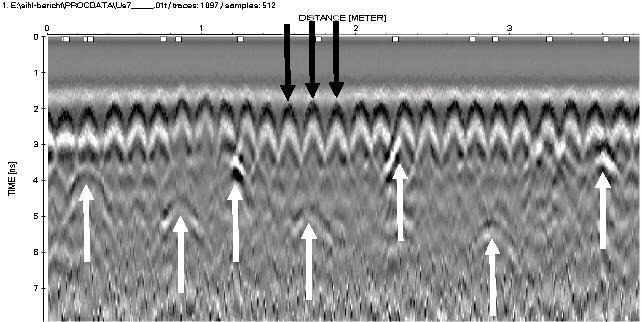 This paper gives an overview on the practical application of GPR using examples from EMPA's recent work. Thus, benefits and limits of this method are shown and recommendations for GPR inspections are presented. 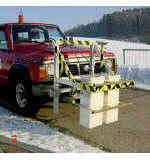 In this paper, some examples of inspections of traffic structures are presented.Benefits and limits are discussed and, where possible, a comparison with ground truth is presented. Obviously, when inspecting bridge decks, railway ballast or pavements the use of a mobile acquisition system is advantageous because of the reduction of acquisition time and the reduced obstruction to traffic flow. In figure 1, EMPA's mobile acquisition system is presented. It consists of a GSSI SIR-20 system (until 2001 a SIR-10 system was used), GSSI model 4205 horn antennas and additional equipment such as a survey wheel or additional antennas that can be mounted if required. Maximum acquisition speed is 80 km/h. 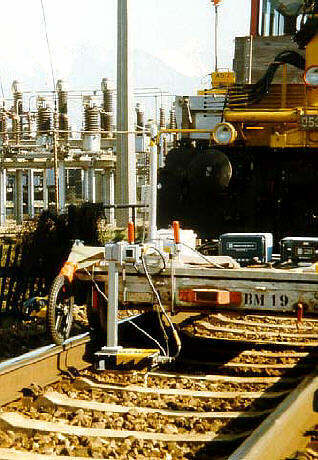 The setup for the inspection of railway ballast is shown in figure 2. The system including a GSSI model 3101D antenna is mounted to a small trailer that is pulled by a small locomotive with a maximum speed of 10 km/h. 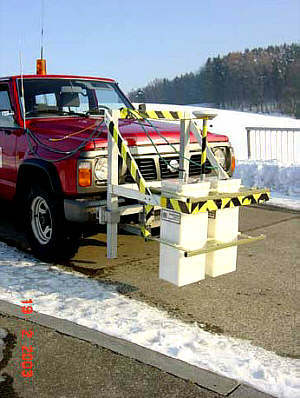 Fig 1: EMPA's mobile acquisition system for pavements and bridge decks. 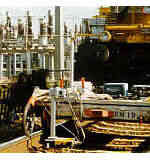 Fig 2: Mobile installation for the inspection of railway-ballast. Fig 3: Manual data acquisition. In some cases data have to be acquired manually. 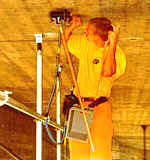 In figure 3 a GSSI model 5100 antenna is moved manually over the bottom side of a bridge deck for the detection of tendon ducts. An overview of some set-ups used for the examples presented in this paper is shown in table 1. Table 1: Acquisition parameters for examples presented. In most cases signal velocities are calibrated with the help of a small number of cores. Those cores are also useful for relating reflections to physical structures. In some cases EMPA has defined velocities by using separated transmitter and receiver antennas . The relation between reflections and physical structures, although straight'forward in many cases, can cause problems. This is particularly the case on roads that have been rebuilt and repaired several times. In figure 4, a 500m section of data from a Swiss motorway is presented. In this case the identification of the pavement bottom reflection (white arrow) is clear. Fig 4: Radar section from a Swiss motorway, length = 500 m.
Fig 5: Radar section from a Swiss alpine pass road, length = 200 m.
The example presented in figure 5 is a 200m long section from an alpine pass road. In this case the asphalt bottom reflection can not be identified without further information such as cores. 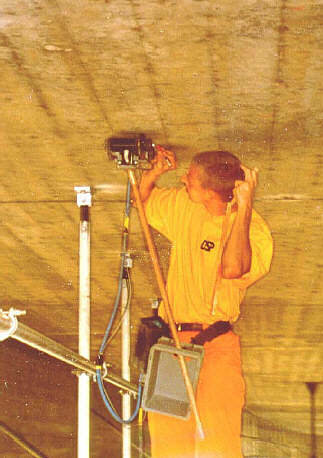 On bridge decks, various issues can be addressed with the help of GPR. Some examples are asphalt pavement thickness, concrete cover of re-bar, position of prestressing- tendons or tendon ducts  and bridge deck deterioration . EMPA is currently carrying out the project "Assessment of the condition of bridge decks with GPR"  where six bridges designated for demolition are inspected. This project is sponsored by the Swiss Federal Roads Authority (ASTRA). Radar results are reported before the bridge is taken down. After demolition radar results are verified through a comparison with actual bridge parts. 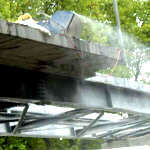 Fig 7: Demolition of bridge deck. Work on the second bridge of this project has been completed recently. Because of the short time-span between radar data acquisition and demolition, the reporting of radar results could not be completed on this bridge before demolition work began. Fig 8: Dataset from bridge deck (line B), length = 40m. 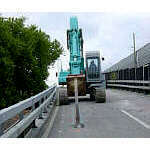 Radar data were acquired with EMPA's mobile system along the 4 lines where the bridge was sawed during demolition. During the removal of the pavement (figure 6),thicknesses were measured with a ruler in distances of one meter. 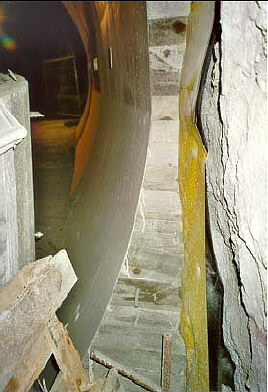 After the bridge had been sawed (figure 7), concrete slabs were stored nearby and the concrete cover of the top layer of re-bar as well as other parameters were measured. The dataset obtained on one of the lines (called line B) is presented in figure 8. The reflections caused by the asphalt-concrete interface (black arrow) and the top layer of re-bar (white arrow) can be easily followed over the whole length of the dataset. Fig 9: Comparison between radar results and reality for pavement thickness. Fig 10: Comparison between radar results and reality for concrete cover of re-bar. The radar results for the pavement thickness (solid line) using a constant signal velocity of 1.43 * 108 m/s for the pavement are presented together with the real pavement thickness (dashed line) in figure 9. The absolute differences between radar results and reality are shown as dots. The same information for the concrete cover of the top layer of re-bar is shown in figure 10. For the concrete, a constant signal velocity of 0.93 * 108 m/s was used. The mean of the absolute differences is 5mm for the pavement thickness and 3mm for the concrete cover of re-bar. Fig 11: Dataset from the bottom side of bridge deck. 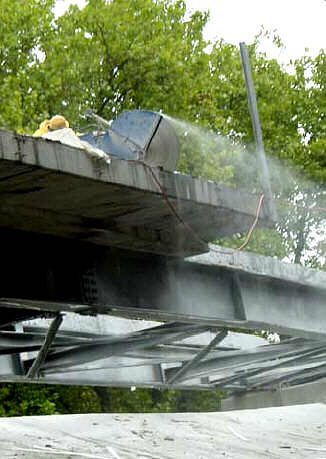 Another important application of GPR on bridge decks is the detection of prestressing- tendons or tendon ducts. Figure 3 shows the data acquisition with a GSSI model 5100 antenna on the bottom side of a bridge deck for this purpose. A 4 m long section of the corresponding dataset is presented in figure 11. There are two types of diffraction hyperbolae. The near-surface diffractions (black arrows) are caused by a layer of re-bar. Beneath, there are the hyperbolae caused by the tendon ducts (white arrows). Obviously the depth of the ducts is varying. This is due to the fact that data were acquired along the longitudinal direction of the deck whereas tendons are running orthogonally from both sides. This is illustrated in figure 12 in a simplified way. Fig 12: Simplified sketch of tendons in bridge deck. A field experiment was carried out on a 12 m long test site, where different wall types were available and where the details of their construction were well known. Figure 13 shows a view of the section inspected. An overview over the different wall types is presented in figure 14. Fig 13: Tunnel wall with waterproofingmembrane. Fig 14: Wall types on inspected section. The dataset presented in figure 15 was acquired in longitudinal direction with the GSSI model 5100 antenna. The distance between the concrete surface of the tunnel wall and the rock surface (not equal to the concrete thickness in sections with waterproofing membrane because of a drainage fleece between membrane and rock) is varying between 0.15m and 0.4m. It is known as it had been recorded as transverse sections in distances of 0.5m before the wall was built. The maximum distance of 0.4m should not cause problems with the depth of penetration of the antenna used . Fig 15: Radar data from tunnel wall, length = 12m. In sections where the membrane is present, there is a clear reflection from the concrete-membrane interface. No reflection is caused by the concrete-rock (siliceous limestone) interface. This is likely due to the similarity in material properties of concrete and rock. In figure 16 a 200m long section is presented, revealing not only several zones where clay had penetrated but also showing the top of the clay beneath the ballast. Fig 16: Dataset from railway ballast inspection, length = 200m. A field experiment was carried out for Swiss Federal Railways (SBB) on three railway lines with a length of 15.1 km . 41 trenches were available during interpretation of radar data and calibration for time to depth conversion. An additional 77 trenches not available during interpretation were used for a quantitative evaluation of radar results.This evaluation showed that the mean difference for the ballast thickness between radar results and reality was 4 cm when using a constant signal velocity of 1.4 * 108 m/s for the ballast. Five of 19 ZOP's found by the trenches were missed by the radar survey because in some locations the material had penetrated only 4cm into the ballast and because of poor data quality in another location. On the other hand many ZOP's that had been missed by the trenches because of the large distances between trench locations were located by the radar survey. GPR is able to deliver relevant information for different types of traffic infrastructure and for a wide range of issues. Comparisons between radar results and ground truth,have shown that the accuracy and reliability of radar results is sufficient for solving many problems related to different types of structures. The availability of at least a few cores supports the calibration of signal velocity and is useful for relating reflections to physical structures. In some cases, cores are a necessity. The author wishes to express his gratitude to Swiss Federal Railways and the building departments of canton Zurich and Uri for permission to publish the results presented in this paper. 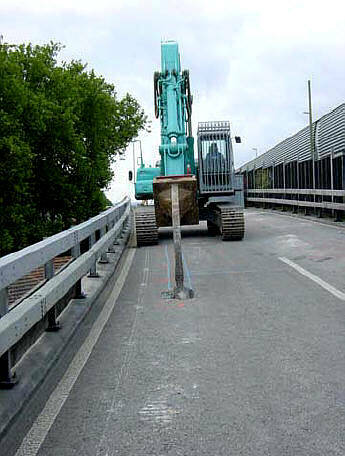 The project "Assessment of the condition of bridge decks with GPR" is sponsored by the Swiss Federal Roads Authority. Parry N. S. and Davis J. L., 1992: GPR Systems for Roads and Bridges, 4th International Conference on Ground Penetrating Radar, Rovaniemi, Finland, Geological Survey of Finland Special Paper 16, pp. 247-257. Roddis W. M., Maser K. and Gisi A. J., 1992: Radar Pavement Thickness Evaluations for Varying Base Conditions, Transportation Research Record 1355, National Academy Press, Washington D.C., pp. 90-98.